Thank you, Dean [Kathryn ] Uhrich, for that warm introduction, and thank you, Chancellor [Kim] Wilcox, for the honor of inviting me to deliver this 2018 Chancellor's Distinguished Lecture. I am overwhelmed to see so many dear friends and colleagues here. Thank you all for coming out this afternoon. I believe it was Robert Louis Stevenson who once described "a friend" as being "a gift we give ourselves." Through the friendships of all of you, you have truly been gifts to me and my family for many years, and I shall always consider UC Riverside our second home. It has been a few years since I last visited this beautiful campus, which I fell in love with during my tenure as Chancellor. I remember the many hours we spent hiking in the Box Springs Mountains to the "C," above campus, with our dog Kobe. We also liked to walk in the UCR Botanic Gardens near our home and all around campus -- without Kobe. We also loved the evening campus Carillon concerts and events in downtown Riverside, particularly at the UCR ARTSblock and California Museum of Photography. We particularly enjoyed cheering on the Highlander sports teams and supporting all campus events with our students, faculty and alumni. I still consider myself a Highlander and always will! I know exactly when I was here last. 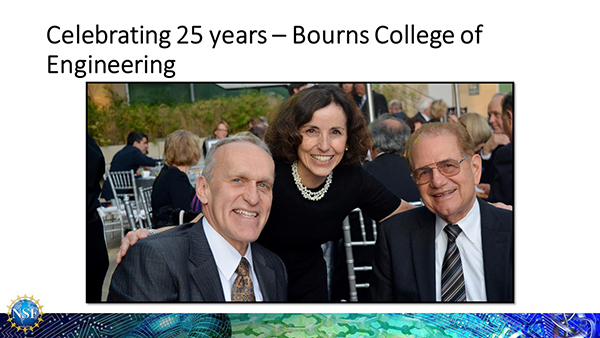 It was in May 2015, when I joined Chancellor Wilcox and former Chancellor Ray Orbach to help celebrate the 25th anniversary of the founding of the Bourns College of Engineering. I remember Chancellor Orbach saying that when the college was named the Bourns College of Engineering, four small trees were planted representing the four Bourns children. He said he was pleased to see that they had grown and were still standing tall � symbols of the success of each of the children. I thought, "That sounds precisely like a Highlander effort � investing in the future of outstanding young people and celebrating as they grow and excel." ... and let me just say, "I love what you've done with the place!" I�m delighted to see that the Medical School is fully up and running. I worked hard to secure the approval of the Regents and the other campuses for UCR's Medical School. I learned a lot about medical education in the process. The Multidisciplinary Research Building is really taking shape and nearing completion. I understand the MRB will be UC-Riverside's first LEED Platinum-certified project. I will confess to having a slight tinge of envy because the new NSF building we moved into a year ago is a LEED Silver building. But that's probably because in northern Virginia, we endure something called "winter" for several months of the year. 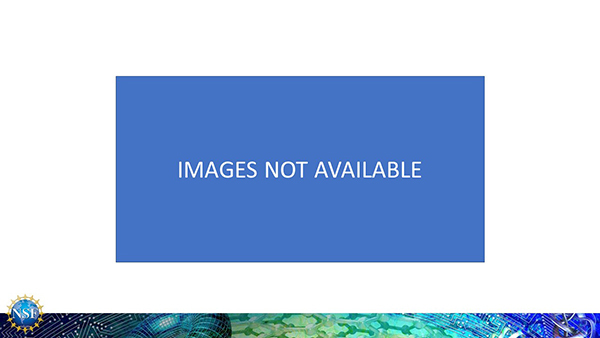 I know � you're all thinking "What�s that?" Living in the east for five years has "educated" me about the differences in weather between east and west. In the east during winter, snow falls all over the place. It falls on the houses, the yards, the cars and the streets. Snow in California falls on the mountains. You get in your car, drive there and play in it and then drive home. Stopping on the way to play golf or go hiking or even go to the beach. Sometimes you bring some snow back to share with friends and neighbors. California weather is, of course, not always perfect. In fact, there are six months of the year when the forecast is "late night early morning low clouds." Kids grow up thinking that's all one word. But, it's warm all the time, which is what keeps everyone coming back. Hmm ... I better stop talking about weather or I'll never take that flight back to Washington. 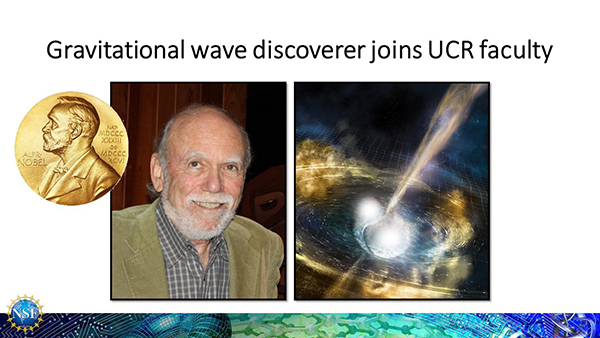 Also, I see that 2017 Nobel Laureate and Physicist-extraordinaire Barry Barish has joined the UC-Riverside faculty. That's great news for all concerned � including Physics and Astronomy Department Chair Kenneth Barish, who will no doubt invite the Nobelist to give an inspiring lecture now and then. Barry played a critical role in the development and operation of the NSF-supported Laser Interferometer Gravitational-wave Observatory � or LIGO -- from its inception through the final design stages, and in subsequent discoveries. In 1997, he created the LIGO Scientific Collaboration, which enables more than 1000 collaborators worldwide to participate in LIGO. And, of course, he was deeply involved � along with his fellow Nobel Laureates Rainer Weiss and Kip Thorne -- in the 2016 breakthrough discovery of evidence of gravitational waves, as first theorized by Albert Einstein in his 1915 General Theory of Relativity. When he announced the decision awarding the 2017 Nobel Prize for Physics, Nobel representative G�ran K. Hansson said, "This year's prize is about a discovery that shook the world." Since the early 1970s, the National Science Foundation has funded the science that ultimately led to LIGO's construction. In fact, LIGO was the single largest investment NSF had ever made. It was a big risk. But NSF's mission is to take that kind of risk, supporting fundamental scientific research at a point in the road to discovery where that path is anything but clear. In other words, NSF funds trailblazers. And that support is a major reason why the U.S. continues to be a global leader in advancing knowledge. As I said at the time, "We're very proud of saying, first of all, that NSF funds basic research like this, and being a physicist myself, and an astrophysicist in particular, this causes my heart to beat faster when I see a discovery about nature and the cosmos." For more than six decades, the National Science Foundation has enabled our Nation's best minds to realize their dreams, engaging the scientific curiosity of hundreds of thousands of scientists, engineers, researchers, educators and students across the country. NSF supports basic research to create knowledge that transforms our future. This support is a primary driver of the economy, enhances our nation's security, and advances our knowledge to sustain U.S. global leadership. The Foundation accounts for one-quarter of the total federal support for basic research conducted at U.S. colleges and universities. In many fields, NSF is the primary source of federal academic support. For example, in Computing, NSF accounts for 82 percent of federal support � in Engineering, it's 41 percent. We must be doing something right, because at last count we supported 236 Nobel Laureates early in their careers � long before they were recognized for their breakthrough discoveries. 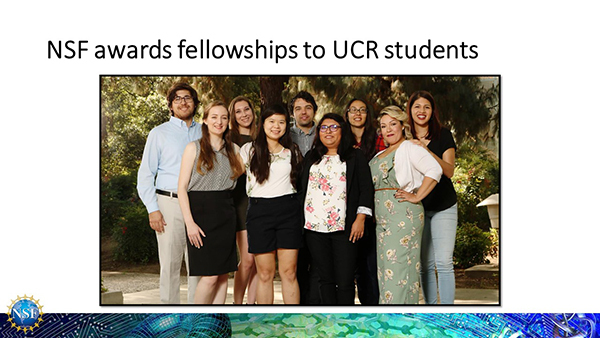 NSF also supports young people � and last May, we awarded fellowships to 11 outstanding UC-Riverside graduate and undergraduate students pursuing research-based degrees in STEM fields. These are just a few of the hundreds of researchers on campus who benefit from the many programs we support here every year. And this leads to another advance I've seen in UC-Riverside over the years. In the pantheon of college campuses, UC Riverside towers above many for its diversity of students and the celebration of diversity, inclusion and persistence by its faculty and staff. Your commitment to excellence through diversity is reflected in the quality of the poetry and novels of your celebrated faculty in literature, in the number and breadth of classes on social issues, in vibrant business curricular options, and in your outstanding reputation in engineering and plant sciences. 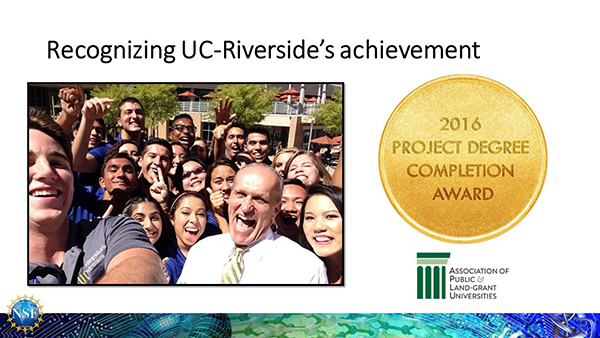 UCR's first-year retention rate is nearly 90%, and its six-year graduation rate is 75% � outstanding numbers that mean a parent can send an aspiring student here and count on him or her to persist to degree, a record recognized by the Association of Public and Land-grant Universities when it awarded UCR its 2016 Project Degree Completion Award. 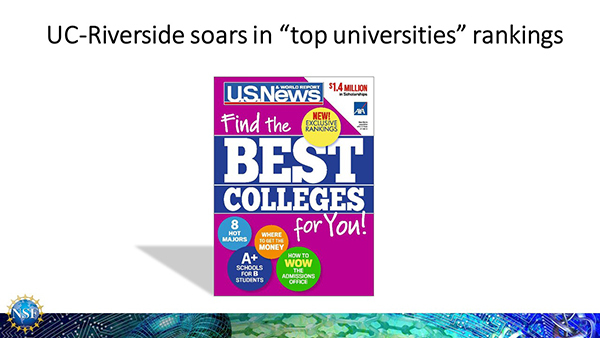 Slide image: cover of U. S. News & World Report "Find the Best Colleges for You!" This year, a new social mobility metric lifted UCR to new heights in the U.S. News & World Report college rankings, with the Washington Post noting that, "UC-Riverside jumped 39 places on the U.S. News list to 85th." INSIGHT Into Diversity magazine has named UC Riverside one of its 2018 Higher Education Excellence in Diversity, or HEED, Award recipients � the only UC university to receive the award. The 2018 award recognizes 96 U.S. colleges and universities that demonstrate an outstanding commitment to diversity and inclusion. 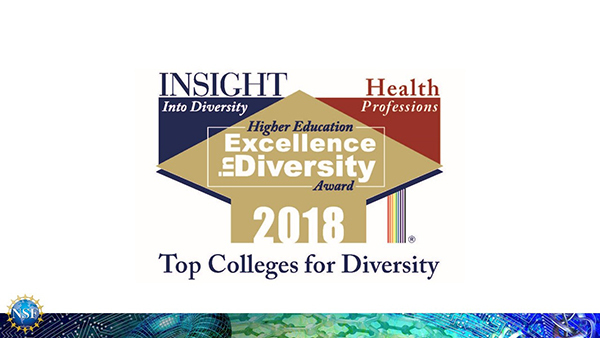 UCR will be acknowledged in the November 2018 issue of INSIGHT Into Diversity magazine. 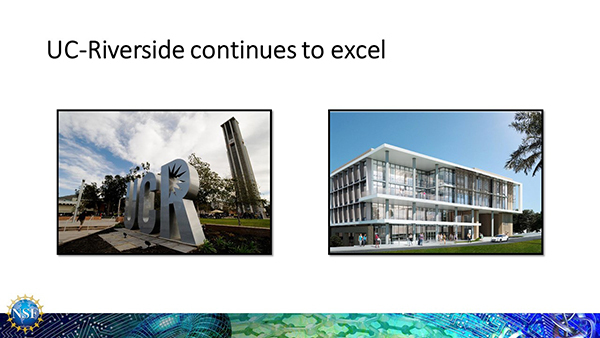 UC-Riverside is held in such high regard by the Council on Competitiveness that it convened one of its four "Exploring Innovation Frontiers Initiative" Regional Dialogues here on "Talent, Diversity, Accessibility and Inclusion in the U.S. Innovation System." and the development of local and regional innovation ecosystems, with a focus on the human element of innovation. Panelists agreed that "the path to more equitable distribution of innovation's benefits is through education that enables individuals to engage with and adapt to new innovations." And they looked to UC-Riverside to continue leading the way to this highly desirable outcome. 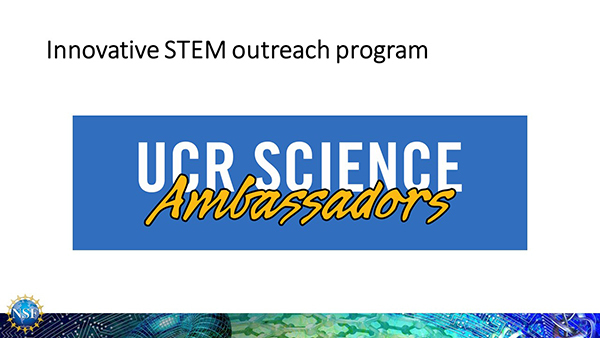 Innovative approaches to STEM education and outreach is also apparent in the Science Ambassadors Program, which represents great opportunities for undergraduate students to represent College of Natural & Agricultural Sciences Undergraduate Programs before internal and external constituents. The Science Ambassadors become the face of the college and assist the school as a host during official functions, make presentations, and act as a student liaison with the various communities that CNAS serves both on and off-campus, with a particular emphasis on recruiting events and activities. My experiences here at UC-Riverside have significantly influenced my approach to diversity and inclusion at the National Science Foundation. Our new NSF INCLUDES program has a goal of broadening participation of all people underrepresented in science and engineering � from K-12 students to university classrooms to graduate school and in the profession. The program is unique in its wealth of pilot projects around the nation, in its approach of collective impact and its adoption of a learning agenda, and in its concept of scaling through alliances, creating a network of projects and a backbone organization, which we call a Coordination Hub. 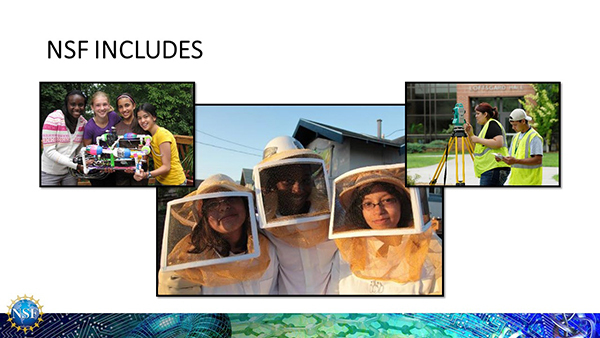 The NSF INCLUDES National Network will include projects from the existing broadening participation portfolio, the five alliances and Coordination Hub funded in FY 2018, and other community stakeholders committed to broadening participation in STEM. 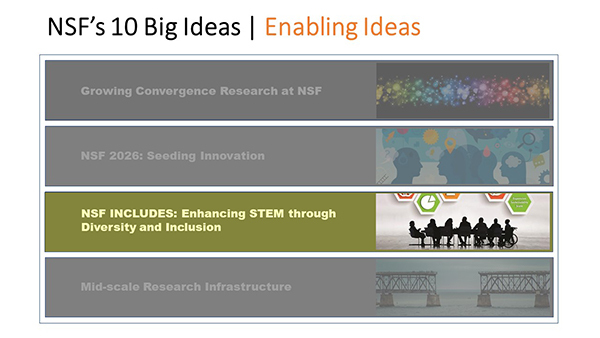 NSF INCLUDES is one of NSF's 10 Big Ideas to transform the future. 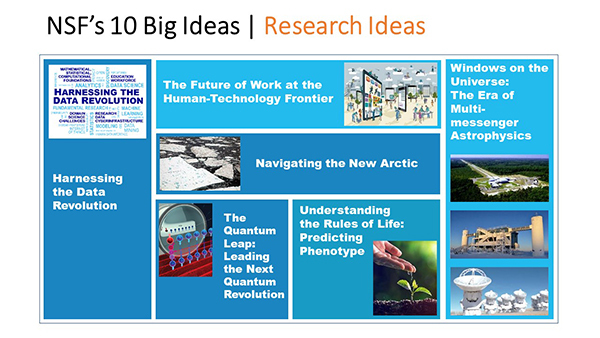 NSF is constantly searching for promising breakthroughs � an effort we labeled "Ten Big Ideas." These are ideas on the forefront of science and engineering that have targeted goals particularly suited to NSF's broad portfolio of science and engineering, and can be realized with increased future investments. The world stands on the threshold of a number of revolutions � in quantum mechanics, in our exploration of the cosmos, and in our understanding of the rules of life, illustrated by several of the Research Big Ideas shown here. The Big Data revolution is underway. It is already transforming science and engineering research and opening up opportunities for new discoveries, made both by humans and by machines. Technology is re-shaping the way we learn, commute, work, play, and communicate. Our focus on the human-technology frontier is to examine ways in which we can shape technology for society's benefit. Here, the challenge is to have machines collaborate with workers, rather than displace them. For example, our Robotics Initiative is leading the way in training robots to work effectively and efficiently alongside humans in the workplace. We also have four Enabling Ideas, which identify "gaps" in what we fund, or how we fund projects. In Convergent Research, we know there are areas of proposed research that don't get funded because they fall between the 'cracks' of what the funding agencies regard as their specialty. 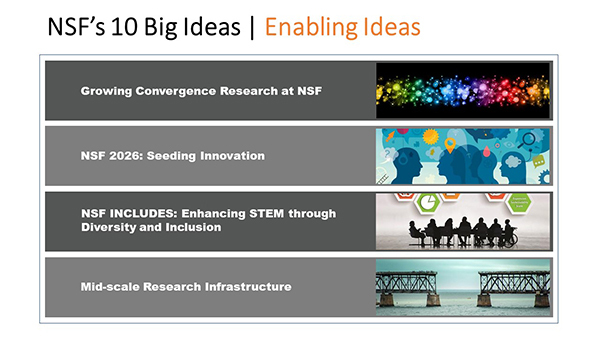 NSF has identified many of the obstacles to convergent research and is committed to trying new approaches to encourage, identify, and fund convergent research. At the same time, there's a gap in our support for mid-scale research infrastructure proposals, those that fall between $10 million and $100 million. Our goal is to close that funding gap and enable new research ideas to be funded. And as we go forward, NSF has recognized that our project planning has to be more flexible and forward-thinking. We are working on a new approach that would help set the stage for breakthrough science. We call this initiative NSF 2026 because in 2026 the United States will be celebrating our "Sestercentennial" � the 250th anniversary of our Nation's founding. 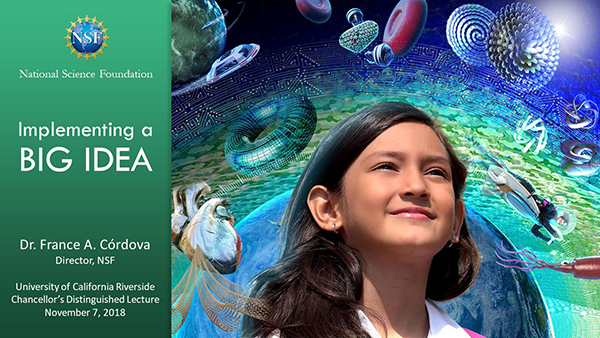 NSF INCLUDES is addressing urgent needs in the development of tomorrow's STEM workforce. To ensure the U.S. does not fall behind, our STEM workforce must be diversified and strengthened. That means investing in people, opening up educational and career avenues for those who have been traditionally underrepresented in STEM fields. NSF INCLUDES builds on and amplifies NSF's current portfolio in broadening participation, because science is too wonderful for it to be exclusive, and too important to leave anyone out. But we must never forget that every successful STEM student has a story that goes back years. NSF-supported scientists come from all walks of life � men AND women of various backgrounds. Some speak different languages at home or celebrate different customs and traditions. The one important trait they all have in common is a deep curiosity about the world around them. I know because I am one of them. This is why UC-Riverside's commitment to diversity and inclusion is so critical to the future of the STEM community and all the benefits that come from having a robust STEM population. And that's why the NSF INCLUDES is one of NSF's 10 Big Ideas to transform the future � AND perhaps the most salient of all ten because transformation starts with nurturing talented, skilled people from all backgrounds. Robust NSF investments in discovery research have returned exceptional dividends to the American people, expanding knowledge, improving lives, and ensuring our security. To keep those benefits flowing, we need to constantly replenish the wellspring of new ideas and train new talent while serving as good stewards of the public trust. That is the fundamental and continuing mission of NSF. Thank you again for the opportunity to be with you today. This is an exciting time for science. I sense that the entrepreneurial spirit is very much present in this room, and it is our goal to nurture it. Thank you again for the opportunity to be with you, and in the spirit of UC-Riverside, "Let there be light!"